Odd title I admit, with it alluding to a deeply weird (well I thought so – had a talking insect typewriter and if you don’t think that is weird I would suggest a trip to the doctor pronto) David Cronenberg movie back in the early 90s called “Naked Lunch” based on a 1959 novel by William S. Burroughs. The reference to “naked lunch” here will become clear later on, honest. 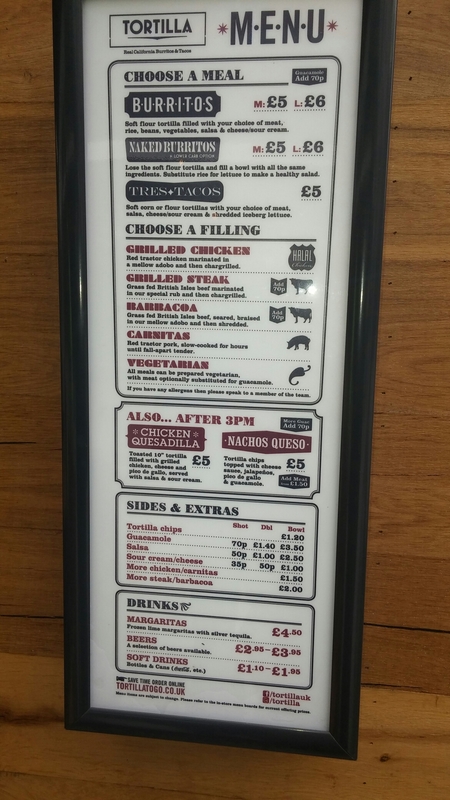 Back to the matter in hand, Tortilla is a chain with multiple outlets in London and 6 outside including Cardiff. 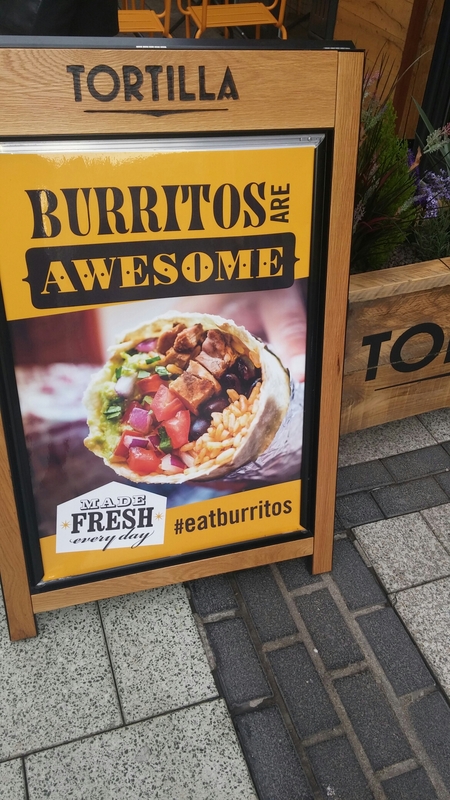 Its strapline is “Real Californian Burritos and Tacos” but it has no Californian outlets as far as I can see (although the founders originate from San Francisco, but are based in the UK, so that is fair enough I suppose). 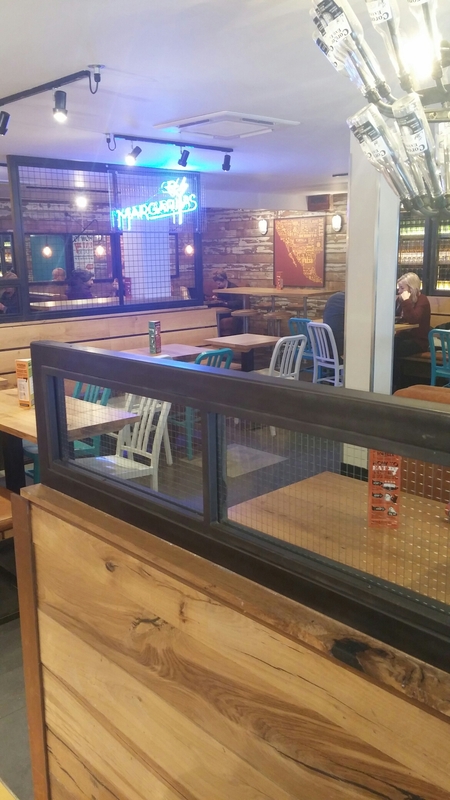 I am not keen on chains, most are awful but not all and I was curious to see what side of the fence this place sat especially as they were rated by Zagat as London’s best Mexican (but not Californian) restaurant in 2013. This suggests real deal “Comida Latina”. 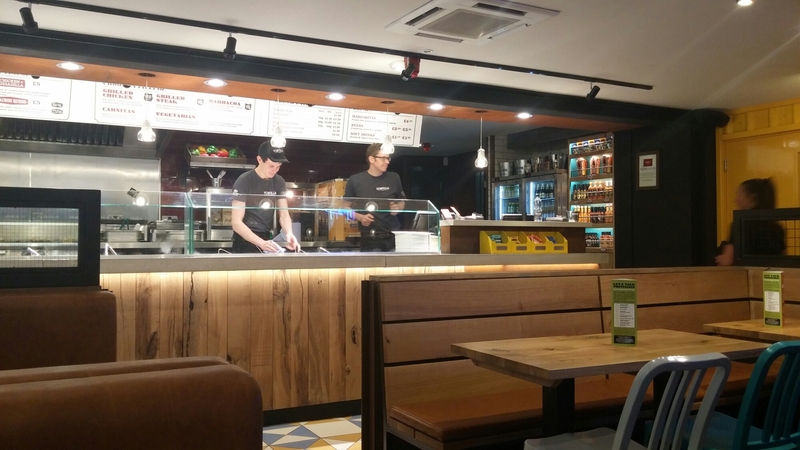 The fact that their setting up in Cardiff resulted in the closure (hopefully only temporarily) of the lovely Spiceberry has lead to some animosity (perhaps unfairly, as not their fault) on my part towards them and for me to sulkishly shun the place up until now. I have, however, belatedly seen the irrationality (well sort of – being a lawyer I find it very difficult to admit I may even possibly be wrong ever) of this position and decided to give it a go. It looked a reasonable place for a not too pricey week day lunch . I went solo as J had rain checked (again) on lunch. where the burritos etc. are made to eat in or take away. There are also some nice design features linked to beer. First off, I need to get a pet hate (one of very many I harbour about a multitude of things) off my chest, in terms of the use of the term “naked” and hence explain the post title. 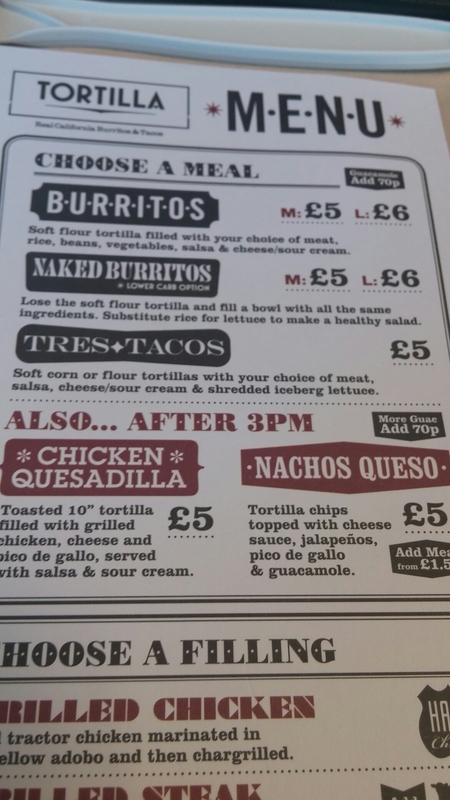 Here the menu includes reference to something called a “naked burrito” (the low carb option apparently – very Cali. 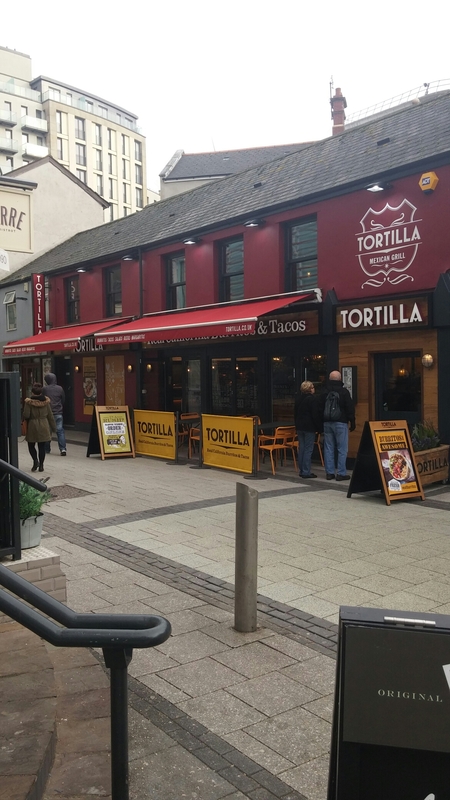 and very un – Caroline Street, “Chip Alley”, where it is located in Cardiff). 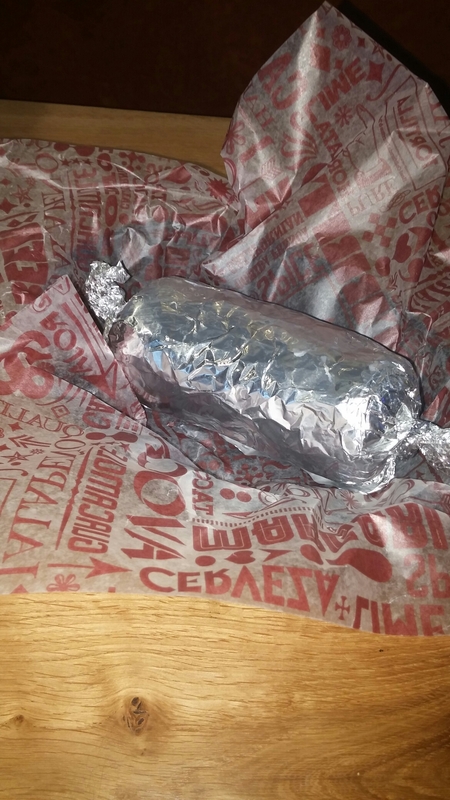 This purports to be a burrito without the tortilla. To me that is no more a burrito than a slice of cheese and ham is a naked cheese and ham sandwich or (it being Caroline Street) a bag of chips is a naked chip butty. This can be taken to truly absurd levels – how about a pile of grated cheese being a naked cheese omelette or a pat of butter being “naked buttered toast”!!!! 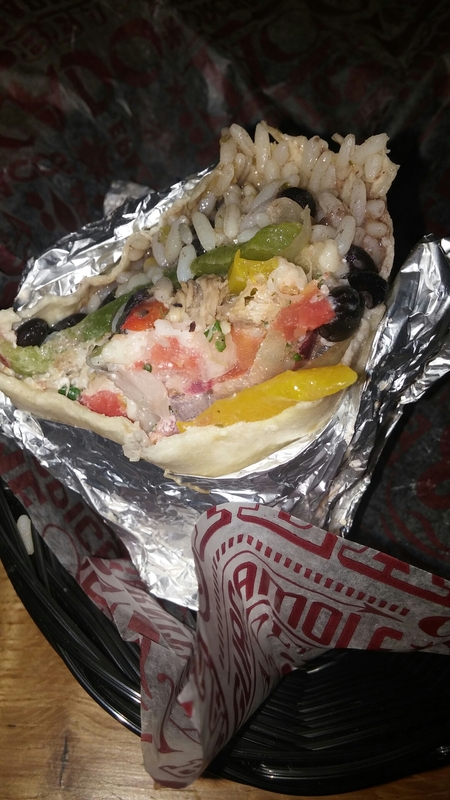 It is not “naked” it is simply “not” a burrito. 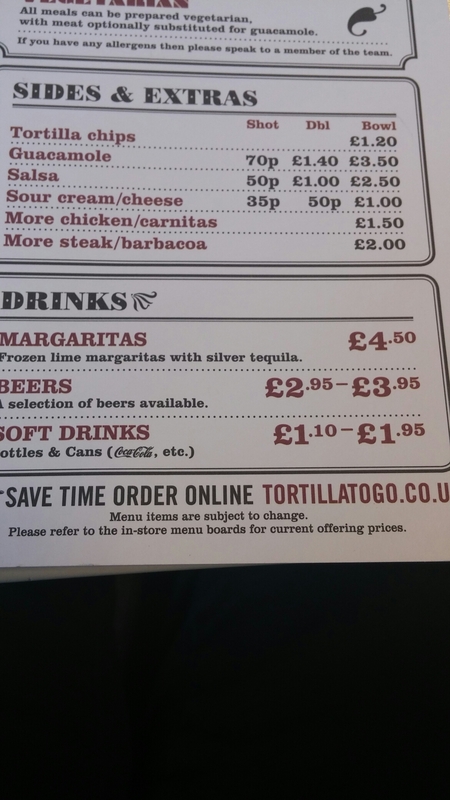 Also seems a bit of a con job to charge the same price as an actual burrito, even though it is lacking a key ingredient. I was never going to order this, hence the ” Not a Naked Lunch” title. 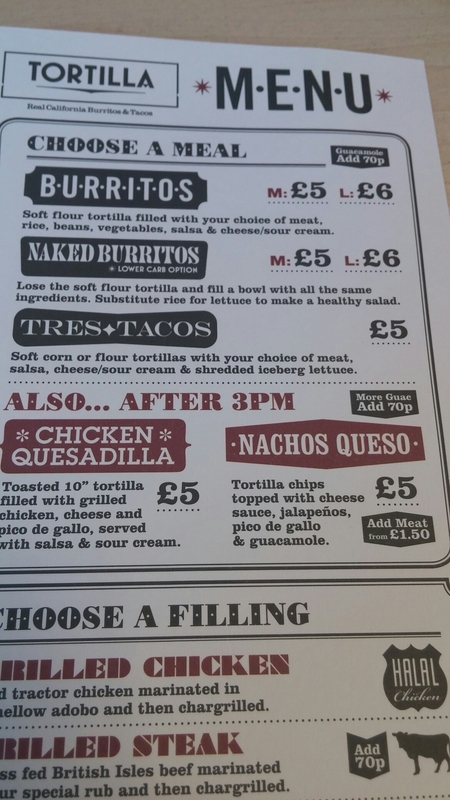 Rant over, the lunch menu is short and sweet, split into burritos (£5 for medium and £6 for large), discounting the naked “not” one, and soft corn or flour tortilla tacos (£5) with a choice of fillings (with the beef ones attracting a supplement over the base price). Being a Californian themed place and California having 800 plus miles of coastline (and Wales having an abundance of quality seafood), I was surprised and a bit disappointed there were no seafood/fish tacos on the menu. Looking at their Twitter feed I think they may, however, be in the process of rectifying this omission. 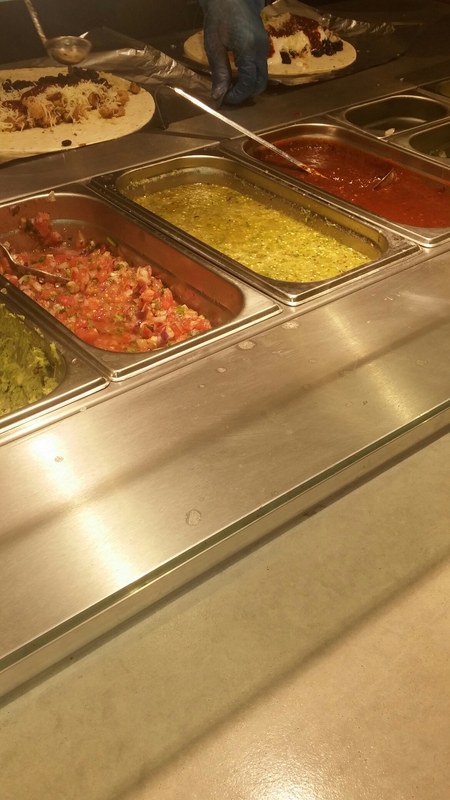 On top of the tacos and burritos, they also do somes sides and extras. After 3pm they add two items, which according to their website form part of an “Evening Menu”. Not sure where in the world 3pm is regarded as evening – perhaps Bognor Regis or “the Sunset of your life State”, Florida. Can’t understand why these “evening items’ are not on offer at lunch time. 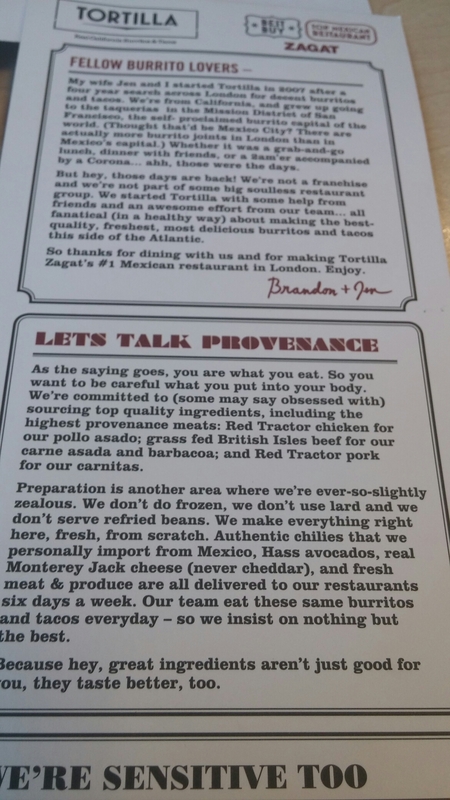 On this basis, I decided on a burrito with carnitas, coriandar rice (could have had tomato rice), black beans (over pinto beans – I prefer refried beans but they don’t do these for some health reason, presumably due to the fact they are suppose to be fried in lard/bacon fat – can’t see the problem with that myself) and fried bell peppers and onions. To this I added (free) cheese (they only use Montery Jack), sour cream and a mild salsa (pico de gallo – medium and hot salsas were also on offer). 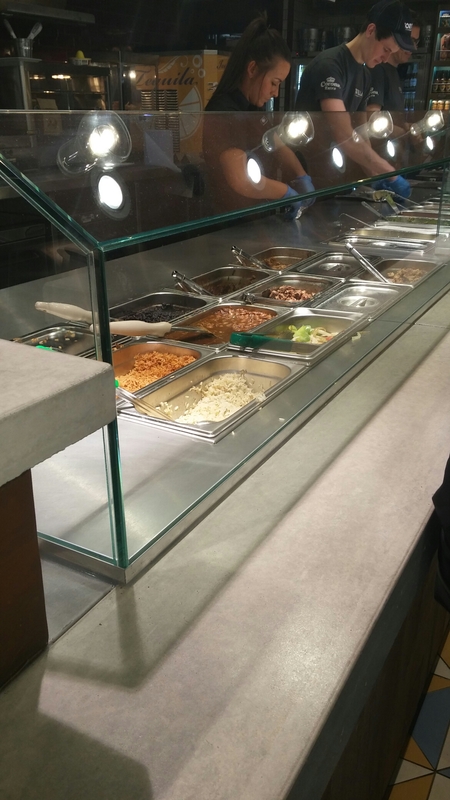 I declined the guacamole (at 70p extra) because I was feeling miserly (an all too common occurrence according to Mrs. SF). All the fillings were properly seasoned and tasty (although I didn’t get any of the promised coriander from the rice). The meat element in the form of the carnitas (slow cooked and pulled pork) was nice, being tender with a good flavour to it. It was not cooked in lard (something they seem to really frown upon in this place – can’t think why as I hear it is the new health food) which is a shame as that is the traditional Mexican way to make carnitas or so I have been led to believe. All in all it was a nice burrito. My only real critisisms are it could have done with more of the carnitas and some refried beans (all cooked in some of the lard or bacon fat that they are seemingly so adverse to). 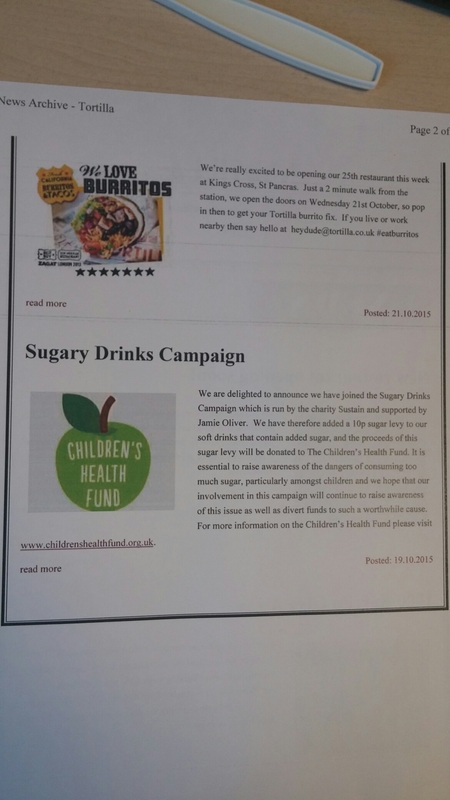 Next rant is regarding the reference on their website to them adding a 10p sugar levy to soft drinks with added sugar (not added to the presumably sugar laden margaritas I note), with the levy going to charity. Yes, I know it is a good cause and it can be argued that adults can make their own choice re sugary drinks but the kids don’t know any better. Who, however, ultimately buys the drinks for the little darlings? Isn’t it the self same adults, who can in the same way choose not to buy them? If you, as a restaurant, think such drinks are so bad and that we lack any self control in terms of buying them or not, surely the best course of action is to not sell them in the first place? Save us from obesity rather than profit from it (still making a massive margin on such drinks I bet and not donating that bit to charity I suspect) and then also tax us for it!! I had a bottle of still water with no added sugar (if I was a cynic – I am – I would think it odd that the price for this was £1 and 10p), but you can get sugar laden beer, margaritas and probably juices without the levy as well as sodas with it. Irritations aside (it is all a bit too right on for me, marketing wise, and I don’t get their aversion to lard, bacon fat etc. ), I quite liked the food. It was decent quality for a fair price and filled me up nicely for lunch at a cost of £6.10 (including a bottle of sugar free water). Can’t really complain about that can I. 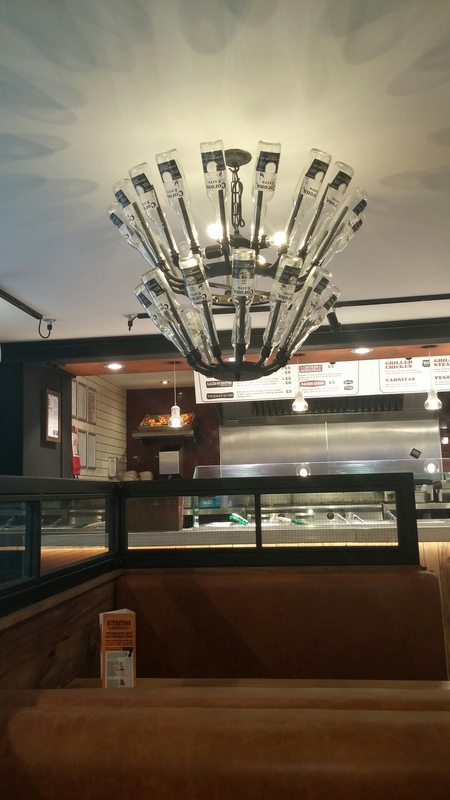 As it is open in the evening, it is also an option for fuelling up before or during a beery night out. They sell beer so you don’t have to stop drinking. Would I go back? Decent quality food at a fair price makes the answer to that question a yes. 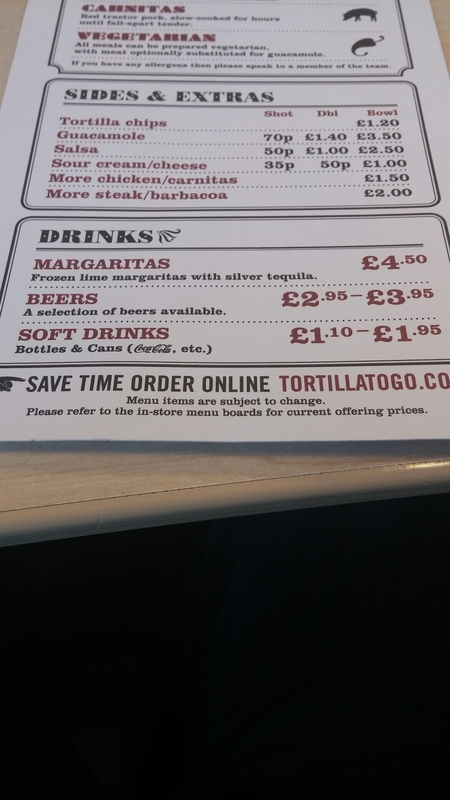 This entry was posted on Nov 29, 2015 by solicitingflavours in Alcoholic drink, American food, Bacon, Beer, burrito, Cardiff, Cardiff restaurant, Fast food, Food, Food and wine products, lunch, lunchtime, Mexican, New restaurant Cardiff, Non alcoholic drink, Restaurant Review, retail, review, taco, Take away, Takeaway, Tortilla, Wales.